Infiniti was introduced to North America in 1989 and ever since then, Infiniti vehicles have been dipped in alphabet soup and branded with letters ranging from E, F, G, I, to even J. The automaker has now announced a new naming system that will streamline the model names down to a single letter, one that has spearheaded the Japanese brand for more than a decade. Enter the letter Q. The first Infiniti Q45 model debuted in 1990 and was the first rear-wheel drive V8 luxury sedan from a Japanese automaker to directly compete against its stylish European rivals. The Q models struggled to win the hearts of the luxury sedan market and suffered from years of dwindling sales. The Q45 was discontinued after 2006, but has been resurrected for one final stand to captivate the audience it left behind eight years ago. Q represents sedans and coupes while QX indicates an SUV. As such, the new Infiniti Q50 has become the next generation replacement for Infiniti’s G35/37 series that had once epitomized the sport sedan image. The G sedans were energetic and represented the brand’s fun-to-drive personality. Before test driving the new Q50, I expected it to retain hints of a G37 with its brazen handling and raw character. Instead I have discovered a tranquil yet refined sports sedan that brings all the cookies to the table. While some hate to see the G-series go, rest assured the new Q50 won’t disappoint. More tamed? Yes, but less fun? No. 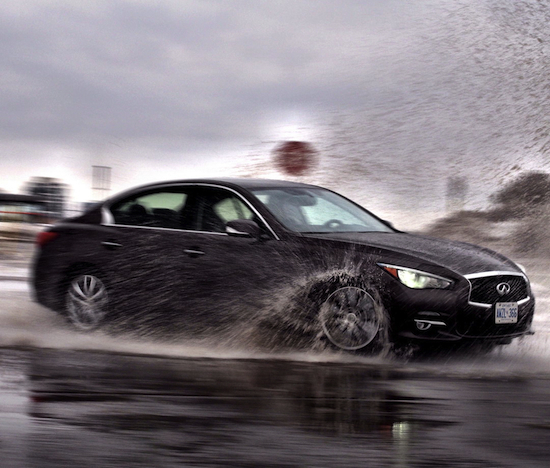 Suited up with the same 3.7-litre V6 engine as the outgoing G37S, the Q50 AWD maintains 328 hp and 269 lb-ft. The only transmission available is a 7-speed automatic and though acceleration is quick off the line, the Q50 is slightly hindered by slow gear changes; if only Infiniti stuck in a dual clutch gearbox and an optional manual transmission. What’s new to the Q-series however is Direct Adaptive Steering (DAS), which comes standard in the Q50S RWD but optional in the other trims. Taking Infiniti ten years to develop, DAS is a steer-by-wire concept where the steering wheel and front/rear tires have no physical connection. The Q50 uses three computers (two as back-ups in case one fails) and a steering angle actuator to direct the wheels following your steering input. The steering feedback is even customizable, allowing you to choose from Heavy, Standard, and Light steering. Many would pass this on as a gimmick that would get old in a week, but I found it extremely useful to select the amount of artificial steering feedback I wanted. When tight and aggressive cornering was required I switched to Heavy. For precise parallel parking, Standard mode did the job nicely, and when I needed a relaxing commute home, Light was the way to go. Infiniti says that this steer-by-wire system helps decrease road vibrations for better wheel control. With less vibrations coming up through the steering column, it also makes for an incredibly comfortable ride. Though Direct Adaptive Steering is in its infant stages, Infiniti engineers are figuring out ways to cut down the number of computers needed to operate DAS to shave off weight and soften the complexity. The Q50 is further customizable with Sport, Standard, Snow, Eco, and Personal driving modes. Personal mode tailors DAS steering preferences and the transmission. Sport mode optimizes vehicle performance and Eco mode cleverly engages the accelerator pedal to actively push back on your foot to reduce heavy acceleration. This promotes economical driving and being in Eco mode for a few hours actually lowered our fuel economy by 0.6L/100km. Not bad! Walk around the Q50 and you will notice hints of the outgoing G37. The same 112.2-inch wheelbase has been transferred over to the Q50 but with a longer, wider, and shorter stance. Infiniti’s aggressive double-arch grill makes it way to the front fascia and helps to shy attention away from its more conservative rear end. After planting yourself into the Q50, the first thing you notice is the suite of technology available at your fingertips. An 8” and 7” dual touchscreen dominates the centre console and has the ability to display your fuel economy and lateral G-force. With companies like Acura and Range Rover trying to decrease the number of hard buttons for driver simplicity, Infiniti has gone the opposite direction and added as many as they can for convenience. Hard buttons and circular knobs are littered everywhere imaginable. Though many prefer the minimialistic cabin, the dedicated hard buttons saved me from traversing through infinite submenus to flip a radio station or tune the heated seats. On a side note, the classic Infiniti clock on the centre console is missing, guess they had to make room for that extra screen. Infiniti has outfitted the Q50 with a myriad of safety features that improve passenger safety and prevent collisions. The Predictive Forward Collision Warning system utilizes radars to detects vehicles in front and will autonomously brake the car if approaching too quickly. Though it doesn’t detect vehicles 100% of the time it’s still a neat feature that wards off rear-end accidents. Much like Acura’s Lane Keeping Assist System, Infiniti’s Active Lane Control uses cameras all around the vehicle to automatically adjust the wheels and stay in the lane. The system actually lets the driver take their hands off the wheel and relax. It works wonderfully on mild bends on the highway, but don’t expect it to take over and make a full 45 degree turn for you, give that a couple of more years. Rather, it provides a boost of confidence on the highway and a wonderful prank for your passengers. The optional BOSE speakers equipped on this Q50 are one of the best in the industry thanks to the meticulous location of the 14 speakers and three subwoofers – one in each front door and one in the rear parcel shelf. Ramp up the bass and connect your favourite tunes via Bluetooth connection and you’ve got yourself a symphony on wheels. Infiniti Connection is now available as an app for the iPhone and Androids that pairs up your Q50 with your smartphone. From there you can lock/unlock your vehicle, set valet alerts, report a stolen vehicle, and set notifications to your smartphone should your vehicle step outside a predetermined boundary or exceed a pre-set speed. We weren’t able to test the app as we didn’t have the vehicle’s identification barcode, but the potential for car monitoring is boundless. Imagine if you lost your phone though. There are two other trims on top of the base Q50 AWD and RWD lineup. The Q50 S trim is an extra $4,050 and adds bigger 19-inch wheels with sport seats, sport-tuned brakes and suspension, paddle shifters, DAS, and an aggressive front bumper that makes even a BMW 335i look tame. A hybrid version is available for the Q50 and pairs up the 302hp 3.5-litre V6 from the M35h and a 67 hp electric motor, producing a combined output of 360 hp.A performance version has also been unveiled at the 2014 Detroit Autoshow, elegantly named the Q50 Eau Rouge. This nuclear powerplant is rumoured to feature a twin-turbo V6 that generates north of 500 hp. The 2014 Infiniti Q50 AWD stickers at a base price of $43,400 and has its crosshairs aimed at its Japanese and American counterparts, the $44,000 Lexus IS350 AWD and the $43,950 Cadillac ATS 3.6L. The trio produce roughly similar performance numbers, are equipped with a wealth of safety technology, and are both much cheaper than their 300 hp German equivalents. The Lexus interior showcases one of the best looking instrument clusters in the market while the Q50 stands its ground with stylishly placed displays that are lag-free and customizable. The ATS speaks volumes about itself with multiple awards around its belt and winning AJAC’s 2013 Luxury Car of the Year. Making a choice between the Q50, IS350, ATS, or even its European counterparts from BMW and Mercedes-Benz is a heated topic in social debates and online forums. Infiniti is determined to make the Q50 shine above the rest with competitive pricing and cutting-edge steering technology that takes one of the biggest steps towards the future of automotive innovation. With an array of performance and coupe/convertible variants eagerly lined up for the 17th letter of the alphabet, it seems Q is back for good.